Impact craters are the predominant landforms on most planetary surfaces and provide important insight into age relationships and surface characteristics. Martian surface ages have been deduced solely from the distribution of impact craters on various geologic units. Crater morphology provides clues to the nature of the martian surface: lobate ejecta blankets and central pit craters common on Mars but uncommon on the Moon may indicate the presence of near-surface volatiles (ice and water). Degraded impact structures record variations in volcanic, fluvial, and aeolian activity. Finally, the shergottite, nakhlite, and chassignite (SNC) meteorites are believed to be fragments of Mars, ejected off the surface by a large impact event. Thus, an as yet unidentified impact crater may have provided us with the only samples of the martian surface to date. Many of the martian landforms produced by the interplay of cratering and surface processes are seen nowhere else in the solar system. Future exploration of Mars will rely on existing impact craters to access materials otherwise too deep to be collected. Impact craters will continue to be important tools in unraveling the mysteries surrounding the red planet Mars. 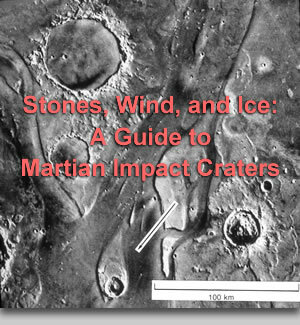 This set of 30 slides illustrates the diversity of martian impact craters and demonstrates their role in understanding the geological evolution of this complex planet. Unless otherwise noted on the image, all Viking Orbiter views of the martian surface are oriented with north at the top of the slide. Scale bars are included on the images and the captions contain size information for specific features. Approximate locations on Mars of the craters included in this slide set.